After an exciting and enjoyable morning shoot at Mono Lake, the three of us continued the Pt by driving up to Tioga Pass, which isn’t open all the way, but was open up to Tioga Lake. 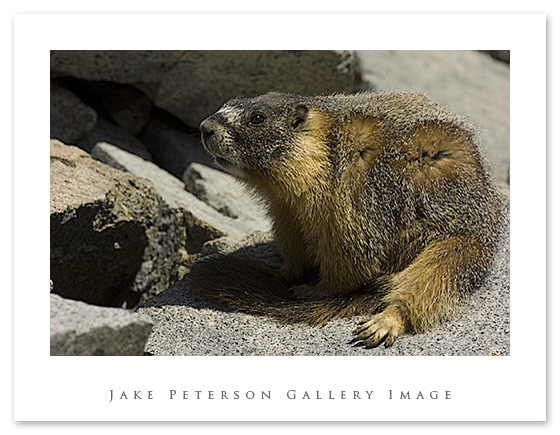 By my favorite fishing hole at Tioga is a rock face that is full of Pika’s, Belding’s Ground Squirrels and Yellow-bellied Marmots. The trick with these guys is getting into a position to photograph them. 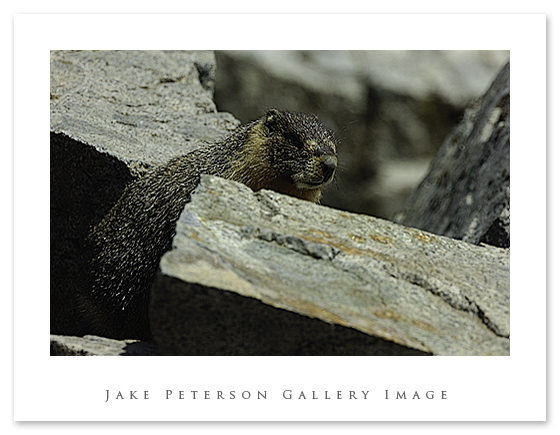 The marmots live on a hillside where any vibration is heard, so when we moved they would duck inside a rock crack or somewhere unseen. When they aren’t up we can get into postion and then wait for them to come back out. It didn’t take long for them to get used to us especially this big guy that sun bathed and cleaned himself for an hour. Although rather lethargic they were fun to photograph. They were a nice treat to end the day on.